Segway of Western PA provides fun Segway PT off road guided tours along the Allegeny River and on the Whitehall Camp and Conference Center. 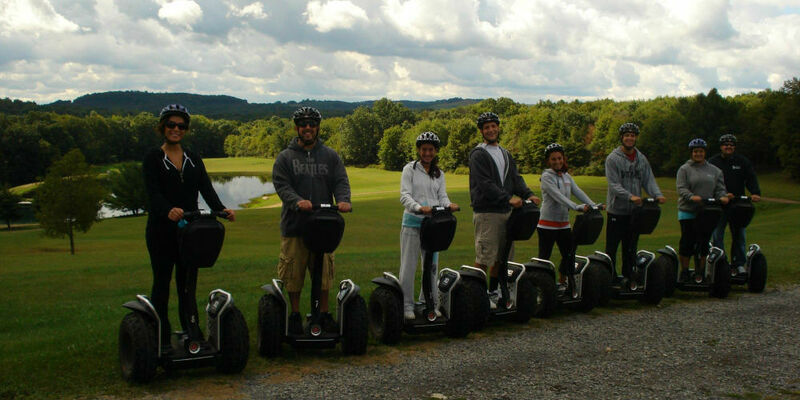 Segway of Western PA has been a full service Segway PT dealer and tour operator since 2008. Bicycle rental and service is also available. Adventure Tour – Our guide will lead you on a fun-filled tour over mid-level bike paths; ride with excitement as we quietly sneak through the lush woods on the rugged new x2 Segway. Your adventure covers several miles of graded trail along the scenic Allegheny River with a couple quick stops to view the hidden gems that can only be viewed from this trail. Then return in time as you view one of the largest and oldest grain mills in Western PA. Then dive into a sweet treat at the Emlenton Creamery provided by Segway of WPA. Bring your camera and your sense of adventure! Tour lengths will last approximately 1-1/2 hours, but will vary with the overall level of experience. We’re serious about safety at Segway of Western PA. Every Segway tour includes a safety briefing and hands-on Segway training, with practice riding time before you hit the trails. Our guides accompany you on ALL our tours to help assure your safety and assist you during your tour. All Segway tour guests are required to wear helmets that we provide at no extra charge. Segway of Western PA is the only and has been the only authorized Segway Dealer in Western PA since 2008. We offer a full line of new and used Segway Personal Transporters Segway accessories and Authorized Segway Tours. Segway of Western PA is a Veteran owned and operated business and provides scheduled and customized tours and events. Whether you’re seeking an outing with family or friends, a team-building adventure or a relaxing ride on a Segway or bicycle, we’ve got you covered! Come in and try the amazing Segway PT in our showroom, FREE! Once you try it, we know you’ll like it, and there are many more ways you can enjoy the amazing Segway with our help. Book a tour, take some serious Segway training or buy one (or more) of your own!